This intriguing little item has hit the press again (e.g. The Guardian). Found in 1990 during excavations on a Roman cemetery and settlement at Shepton Mallet, it caused immediate interest as it was discovered in a grave and it is one of the very very few pieces of personal jewellery from Roman Britain bearing a chi-rho symbol. 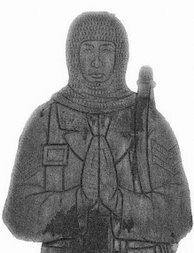 It became a highly symbolic object and was reproduced in replica form and given to the the Bishop of Bath and Wells (one George Carey). However, there were suspicions about the authenticity of the object voiced very early. Even before tests on the metal composition in the late 1990s and this year confirmed that it was made from a modern rather than ancient alloy, several archaeologists expressed their scepticism about the item. As a Christian item found in a grave it was highly peculiar; whilst it is not unknown to find grave-goods used in a probable Christian context in the Late Antique world, it was to say the least, unusual; there were certainly no parallels in Roman Britain. 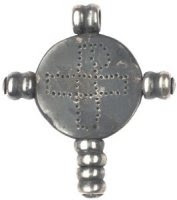 It had some similarity with a brooch found in Sussex in the 19th century, but the clumsy way in which the chi-rho had been created by punched holes made for a very unsatisfactory item. So...it does turn out its a fake, but this leads on to two obvious questions: who dunnit and why? There are a number of possible reasons; as the newspaper article notes there was much opposition to the development, and it may have been placed there in an attempt to stop the building (lets not forget that Planning Policy Guidance Note 16 did not come into operation until the November of that year). It does seem a somewhat costly way of preventing the development- there would have been the cost of the silver (admittedly probably not that much), but also the time needed to design and make it. Either the culprit had reasonable jewellery making skills themselves or they had to commission someone else to make it (which would mean more than one person was involved). Whilst the design may have been clumsy copy of the Sussex brooch, it does show that some level of research had gone into the design. The decision to plant a Christian-inspired piece is also intriguing; it shows a good eye for things that would click effectively with public opinion. This wasn't just a quick prank, but a carefully conceived and thought-through project.